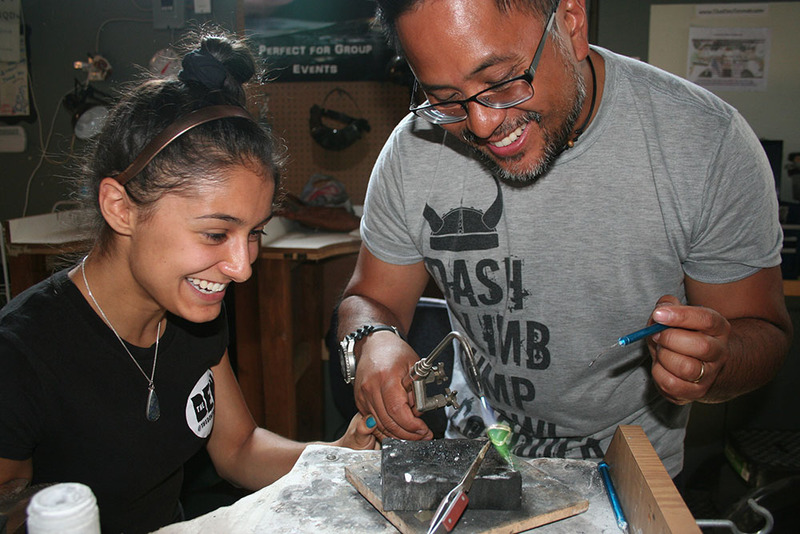 Make your very own custom jewellery piece (ring, pendant, bracelet, etc) during this unique one-of-a-kind experience. Enjoy these special Valentine Packages Just for the month of February! And we will give you a FREE upgrade & love basket ($280 value in savings), because we too are romantics! Love Basket Includes: Materials for your first project, a bottle of Bubbly, Chocolates, and a file of photos & short videos clips of your experience. In our Valentines Love Basket, you will receive your first 4mm ring or pendant in stock Sterling Silver towards your first project. Depending on workshop chosen 3-7 additional projects may be made in the same class. We have increased our available workshop dates just for our FEBRUARY LOVERS workshops over valentines so make sure to book in your preferred date ASAP. Enjoy becoming your very own designer silversmith. Playing with fire, our instructors train in a fun way that creates an unforgettable experience. The following workshops are available for this promotion: Ring & Bangle, Stacking Rings, Spinner Rings, Stamping Projects, Private Workshop.